This simple and delicious gluten-free fried chicken tenders recipe is made with homemade, gluten-free, panko-style crumbs. Panko crumbs, or Japanese breadcrumbs are flake-like, coarsely ground bread crumbs used to make crisp, lightly fried foods and crumb toppings for casseroles. This easy and incredibly tasty, light-and-crunchy, gluten-free, panko-style breadcrumb recipe is perfect for chicken, fish, vegetables or anything else you might want to bread. When accompanied by a gluten-free fry batter recipe (substitute club soda for the gluten-free beer if you wish), you'll have a match made in heaven. Place the Rice Chex cereal in a plastic bag. Use a rolling pin to crush the cereal to coarse flakes. Season with salt and pepper and any herb blend that you like. Combine GF all-purpose flour, cornstarch, baking powder, sugar, cayenne pepper, garlic powder, onion powder, salt and pepper in a large, plastic zip-top bag. Shake the bag to thoroughly mix the dry ingredients. Pour this mixture into a medium-sized bowl. Add gluten-free beer or club soda and mix until the batter is smooth and not too thick or too thin. Add more liquid if the batter is too thick. Slice the boneless, skinless chicken breasts into 1-inch strips. Dip the strips in the fry batter. Thin the batter, if necessary, with water or club soda until it lightly coats the chicken strips. Roll the battered chicken strips in the crumbs to thoroughly coat. 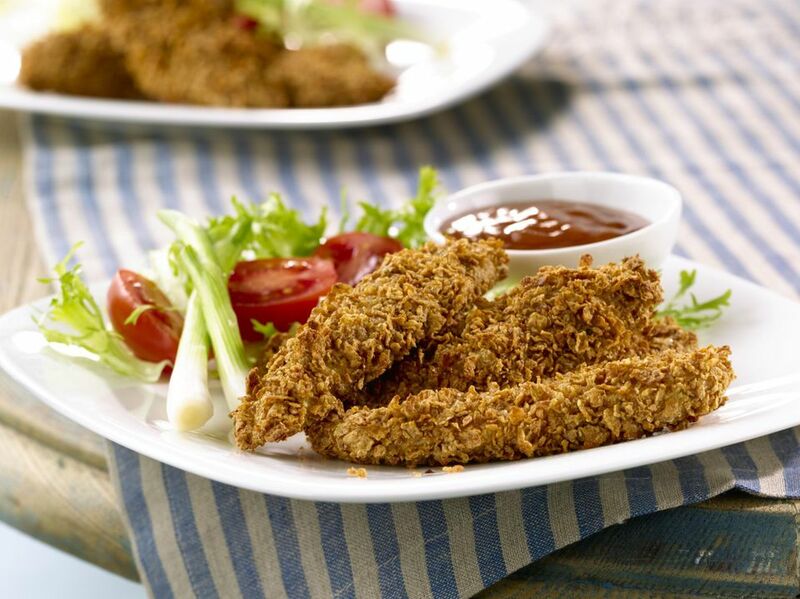 Refrigerate battered and crumb-coated chicken tenders for at least 1 hour prior to frying. Fry in 375 to 400 F cooking oil, until golden brown, about 8 minutes or until done. Note: Coat, tightly wrap, and refrigerate chicken strips for up to 24 hours before frying for real convenience. Also, always make sure your work surfaces, utensils, pans and tools are free of gluten. Always read product labels. Manufacturers can change product formulations without notice. When in doubt, do not buy or use a product before contacting the manufacturer for verification that the product is gluten free.